After their critically acclaimed debut,3 Feet High & Rising , De La Soul was left in an interesting predicament. While most loved and accepted them and their music for what it was, their street cred was still questioned by some and the black hippy stigma that followed them left a bit of a chip on their collective shoulders, so much so that it would influence the title and concept of their sophomore effort. 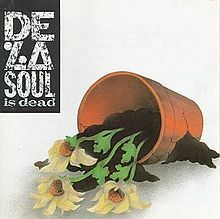 De La Soul Is Dead , which is a clever album title by itself, was matched in wit with its album cover artwork, which displays a flower-pot of daisies spilled over as a visual metaphor for the end of the 3 Feet High’s daisy era, and a new beginning for De La Soul. Even with their “new beginning” some of the same pieces remain intact on De La Soul Is Dead , such as Prince Paul co-producing the whole album along with the De La brothers. De La Soul Is Dead is one of only 15 albums to ever receive the once coveted 5 mic stamp of approval from the once credible hip-hop bible, The Source magazine. Without further adieu…De La Soul Is Dead . Intro – Inside the liner notes there is a short comic strip, or as Prince Paul introduces it as “the De La Soul read along storybook”, that even prompts the listener with a bell when it’s time to turn to the next page. This intro covers the first 4 pages of the book. Oodles of O’s – After all these years I’m still not sure how I feel about this song. Mediocre at best. Talkin’ Bout Hey Love – After a long opening instrumental that liberally borrow’s from Stevie Wonder’s “Hey Love” (including a portion of Stevie’s vocal sample) and features an uncredited tone-deaf female vocalist, Posdnous partakes in a conversation with a woman who wants him to commit to her, making her his one and only. Not terrible, but this doesn’t add much to the album. Pease Porridge – Pease (or peace) porridge is to De La Soul what spinach was to Popeye. The porridge gives De La strength to maintain their peace and sanity, especially when suckas want to test them, mistaking them for soft hippy rappers. Trugoy puts it best:”We bring the peace of course, but pack a nine inside my De La draws, a picture painting pic, can turn to red and bloody quick”. From the instrumental, clever hook, Posdnous and Trugoy’s verses, and the playful fight interlude and commentary near the end of the song, this song is executed beautifully. Skit 1 – Page 5 of the read-along storybook. Johnny’s Dead AKA Vincent Mason (Live From the BK Lounge) – This is the first of a few faux-live performances from the BK Lounge. No matter how many times I listen to this I still laugh out loud at the singer (who I believe is Prince Paul) as he reenacts Johnny screaming after he got shot. Hi-larious! A Roller Skating Jam Named “Saturdays” – One of the singles released from De La Soul Is Dead : A dedication to roller skating on Saturday nights. I still love this song, and don’t think it will ever get old. Shoutout to Native Tongue regular contributor Ms.Vinia Mojica on the hook. Bitties In The BK Lounge – There are really two parts two this song: the first part is Trugoy’s forgettable verse (as well as the instrumental that accompanies it). The second part of the song is a ranking session between Posdnous, who plays a BK worker, and a customer named Sashana, looking to place her order with him. The back and forth between the two works pretty well, and the Lou Donaldson loop sounds a lot better than the instrumental thrown at Trugoy. Skit 2 – Page 6 of the read-along book. My Brother’s A Basehead – In true De La Soul fashion, Posdnous takes on the serious topic of living with a crackhead brother and makes it easier to digest with his lighthearted approach. This might have gone over better with a more entertaining instrumental. As is, its below average. The phone conversation at the end between the lady and guy describing Posdnous as the “one with the nappy hair…with the glasses” was pretty comical. Let, Let Me In – This one picks up where 3 Feet High’s “Jenifa Taught Me (Derwin’s Revenge)” leaves off at, with each of the trio politely asking the objects of their erections to let them hit it. Never thought about it before, but the instrumental uses the same sample that would be used later the same year for Cypress Hill’s monster hit “How I Could Just Kill A Man”. Afro Connections At A Hi 5 (In The Eyes of the Hoodlum) – This was okay. Rap De Rap Show – A faux promo for the faux radio deejay Dodoman for the faux radio station WRMS. Millie Pulled A Pistol on Santa – One of my top 5 De La songs of all time. De La takes on the difficult topic of child molestation. Everyone should listen to this song at least once in their life. Deep, dark, and classic. Who Do U Worship? – In all of Prince Paul’s brilliance, there are a few times where he goes to far or misses. This is one of those times. Skit 3 – Page 7 of the read-along book. Kicked Out The House – Though they claim their not trying to dis house or dance music, they are definitely taking a shot at it over this faux-house track. Pass The Plugs – I love Prince Paul’s melancholy/reflective instrumental. Posdnous, Trugoy, and Prince Paul each turn in solid verses, but the instrumental is the true winner on this song. Ring Ring Ring (Ha Ha Hey) – The lead single from De La Soul Is Dead . This is a dedication to all the desperate inspiring artists who dropped De La a demo and followed up with a phone call or two (or two dozen) after not hearing back from the brothers. The Whatnauts borrowed bass line is infectious and will never get old. Another one of my De La top 5. Shwingalokate – Not really feeling this one. Fanatic Of The B Word – This kind of works as the companion piece to 3 Feet High’s “Buddy” in a round-about-abstract-kind of way, I think. Mike G of the Jungle Brothers starts this one-off with opening words and Native Tongue new comer, Dres of the Black Sheep, spits a verse alongside Pos and Trugoy. You might not gravitate to this one right away but it will grow on you over time. Keepin’ The Faith – Posdnous and Trugoy each spit a tale about two different girls who choose to remain celibate for religious beliefs. I realize when De La wrote this song they were still in their early twenties and immature, which might explain why they take shots at the ladies who take this stance. Now that I have two daughters of my own (and I know Posdnous has a daughter as well) this song is harder to digest today than it was yesterday. Regardless of your perspective on the topic we’ll all agree that this isn’t one of their strongest songs. Skit 5 – And finally, page 10 of the read along book. And with that, we’re done. De La Soul Is Dead is supposed to mark a new beginning for the trio, distancing them from the black hippy stigma they acquired after their debut. In my opinion, they simply picked up where they left off at on 3 Feet High , as the production and content doesn’t stray far from that of the previous record. If anything the beats and rhymes have matured on De La Soul Is Dead . Leave it to a conceptual genius like Prince Paul to take a group’s vulnerability and turn it into viable art. Did The Source Get It Right? As much as I love De La Soul, I don’t know if this should be a 5 mic album. While the majority of it works well, with 27 tracks in length, its inevitable that you’ll have some filler joints, or some songs that just plain don’t work. De La Soul Is Dead is no exception to the rule. One of my faves. I love oddles of o’s.